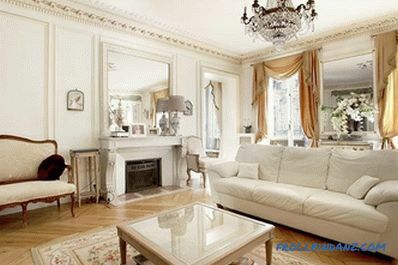 What is the French style in the interior and what are the main characteristic features of it? 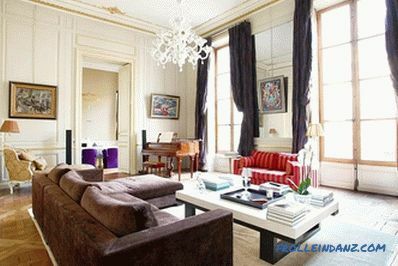 To answer these questions, you can carefully consider the interiors of modern French apartments. Despite the strong distinction of decorative elements, ways of finishing surfaces, a variety of furniture that fills the atmosphere, they all share a sense of special taste, incredible convenience and luxurious simplicity. French style has many nuances and shades. One of which is Provencal style. 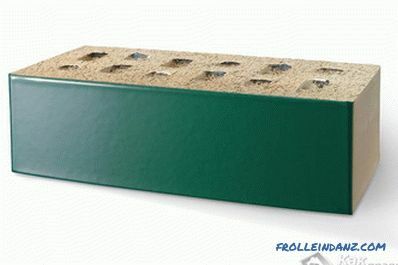 But it is more suitable for decoration of country houses, for creating a calm, rustic atmosphere in them. 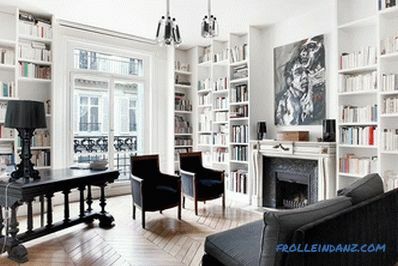 We will consider the urban version - the French style in the interior of the apartment. The French style in the interior is an ethnic, not a historical style. Therefore, the design can freely be attended by the echoes of various historical eras and styles - baroque, empire, classical, modern. 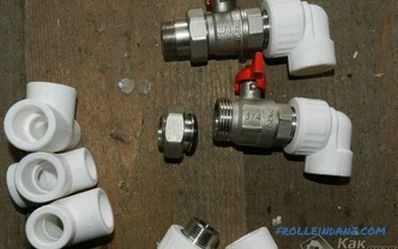 What is remarkable: the French are absolutely not wasteful and thrifty. They respect the history of their people, their families, their homes. Furniture, paintings, mirrors, photo frames are handed down from generation to generation, stored and not thrown away. A shabby wardrobe from the time of Louis XVI can occupy a worthy place in a modern interior, while it can coexist with a 19th century wrought iron and modern vases or lamps. This has a special charm and beauty. Furnishing a spacious family bedroom with an antique wardrobe. Old wooden doors that complement the new bathroom fixtures. As for antiquity, it can be skillfully combined with new pieces of furniture. Designers advise boldly mix old and new, play on the contrast. Things with an interesting story are exactly what you need. 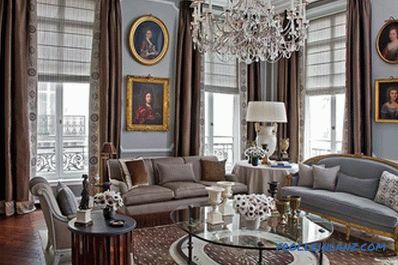 They set a certain mood and tone, help to create an interior design in the French style. If the apartment does not have old pieces of furniture, then it is not necessary to purchase them in an antique shop for crazy money. The French make it much easier - they go to the flea market to find the missing piece of furniture there. Tip: if you want to add a certain charm of antiquity to the atmosphere, but the variant of an antique shop or a flea market does not suit you - wear out the furniture or decor yourself. Cracked or slightly worn paint, brass matte hardware, faded fabric will help to achieve the desired effect. 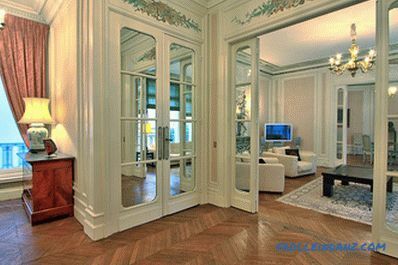 Apartments with antique parquet and updated door designs. a combination of different chandeliers, lamps and floor lamps. 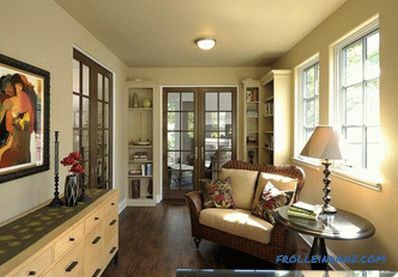 The living room-library with a fireplace. Important: when working on creating an interior in French style, it is necessary to moderately fill the room with objects and decor. The abundance of luxury or old items can overload the situation. 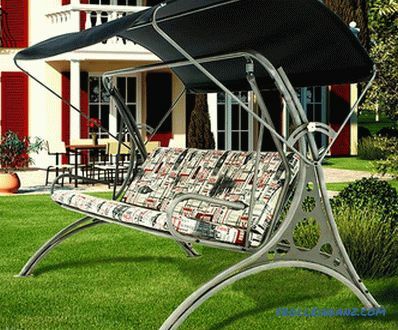 As a result, the interior will be luxurious or pompous. One must strive for a refined and simple setting. Exquisite living room in classic French style. Modern French style in the interior highlights convenience and restraint. Luxurious and antique items do not occupy a dominant place, they are presented as necessary objects of furniture. Elegance is complemented by deliberate disorder. That is, you do not need to strive for perfectly adjusted design, perfect symmetry or purity. It is necessary to allow a little carelessness. This is the way to achieve the feeling of a romantic and comfortable atmosphere. A kitchen that combines old and modern textures and materials. cozy small cafes with separate rooms and a summer terrace. 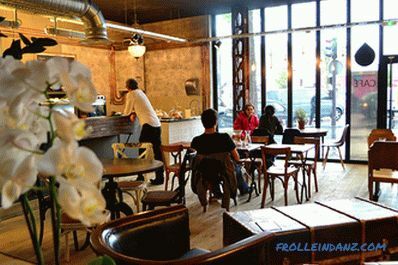 A lovely Parisian cafe with a vintage and comfortable atmosphere. Cozy in an apartment furnished with taste and complemented by objects of art, everyone who loves life itself in all its manifestations, who cannot imagine itself without romance and beauty, will feel. Modern monochrome interior with various lamps and paintings. 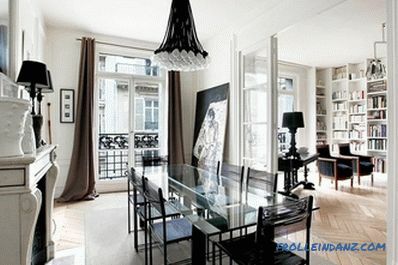 A spacious apartment with separate separate rooms and high ceilings will suit the French interior design project. 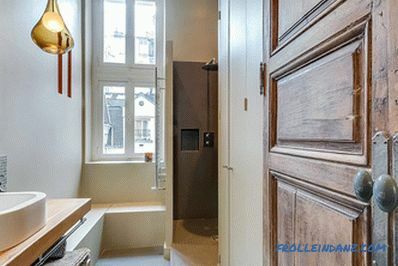 Today’s popular urban layout of a studio apartment is not a suitable option, as the French prefer an original layout with separate rooms, corridors and storage rooms. rooms with high ceilings (well, if they are decorated with stucco). 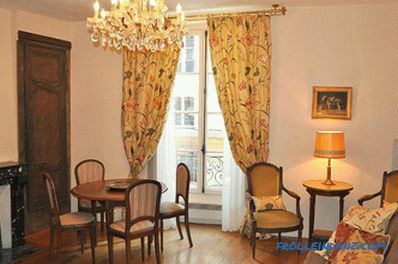 Spacious room with large windows, parquet flooring and high ceilings decorated with stucco. 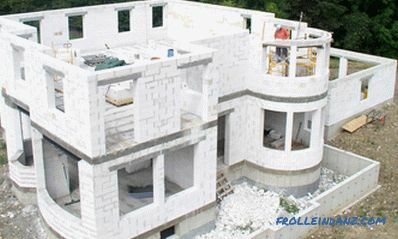 "Leave the walls alone, let them be white," say the French. 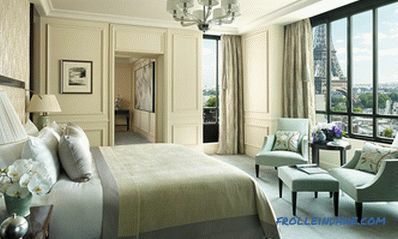 And this is the essence of the color policy, which is dictated by the interior design in the French style. White - the fundamental color of the interior. 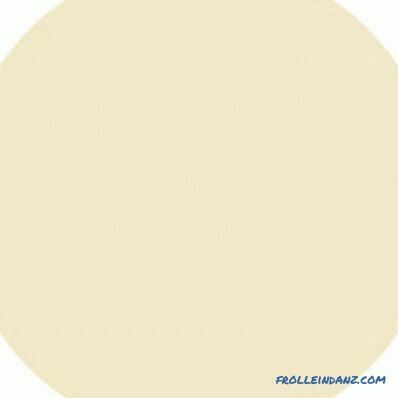 White can be walls, ceilings, floors, furniture, decor. Refined dining room in light beige tones. A stylish bathroom in white and ash colors. Basically, contrasting color combinations are rarely used in French interiors. The basis of taking one color and complement its shades. 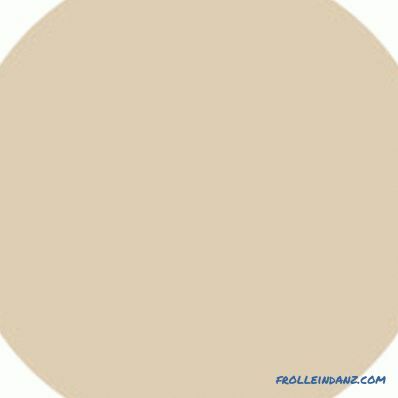 For example, brown is complemented with sand, coffee, white, beige, and peach. Maiden's bedroom in brown tones. Important feature: the modern French style in the interior easily combines different patterns. For example, floral and floral motifs can coexist with a geometric pattern or a complex ornament. Combination of patterns in the interior. Depending on the historical style that formed the basis of modern French design, they also choose finishing methods. That is, an apartment in a new building can be made with elements of a classic or renaissance, complementing the interior with gilded stucco or frescoes. The apartment of the old building is not altered, but only preserve its original appearance. For example, in Parisian houses of the 17th and 19th centuries, apartment buildings are distinguished by high ceilings with stucco and parquet floors. They are not removed due to limitation and wear, but try to keep. 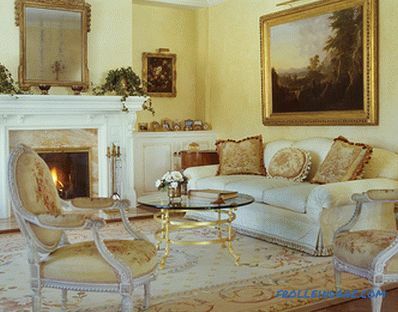 The interior of the living room, which combines old stucco with gilding on the ceiling and original flooring with modern furniture and textiles. select a beautiful central chandelier. 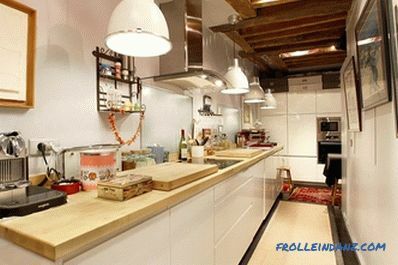 For the urban style of France is not typical decoration of the ceiling with wooden beams. 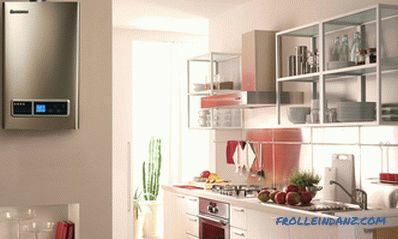 This feature is more suitable for Provencal style. Designers and suspended multi-tiered ceilings do not recommend. If you choose a stretch ceiling, it is better to give preference not to a glossy film, but to a patterned or one-tone fabric. Walls can be left just white. So it will be convenient to create an interior on their background. Walls are also covered with wallpaper with an ornament, painted with matte paint and decorated with paintings in beautiful frames. Well, if there are niches in the walls. They have flowers, sculptures or lamps. If the house has old parquet, even if it is not of the best quality, you need to try to keep it. To do this, re-grind it, update the damaged boards and open it with varnish. 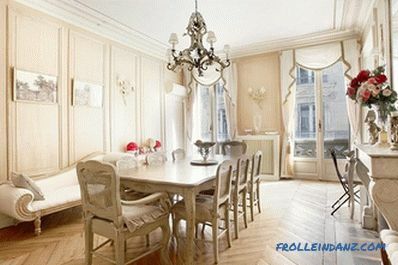 Parquet flooring is the basis of the French interior. If the parquet is missing, then lay a new floorboard or laminate. In the kitchen and bathroom using a beautiful tile - mosaic. Cabinet with a painting for an old fresco and preserved parquet. The main feature of the furniture that characterizes the French style in the interior is antiquity. new furniture from the historical collection (baroque, empire, classic) aged by artificial means. The bedroom is furnished with wooden furniture decorated with artistic carvings. 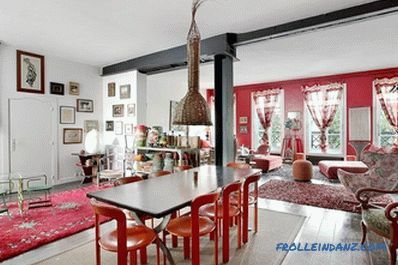 Tip: it is not necessary to fill the room with antique and expensive items only. 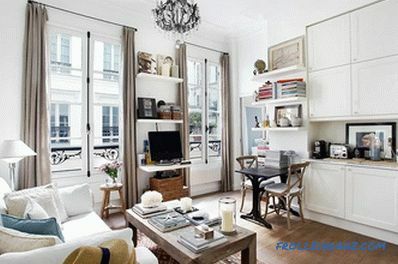 If the situation is overloaded, then the simplicity and charm of modern French style in the interior cannot be conveyed. You can beat one old item, adding to its simple modern furniture. For example, a beautiful oak bed is combined with modern armchairs and a dressing table, and an elegant Art Deco armchair is complemented by a modern seating area and a tea table. 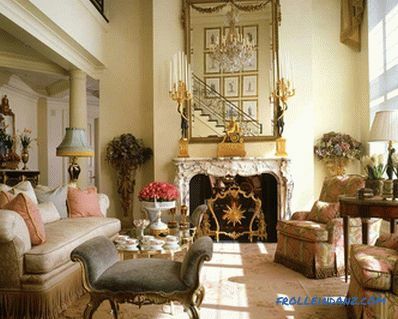 The French style in the interior allows for a combination of the most varied in style, form and cost of the lamps. There should be a lot of them in the room. Floor lamps and lamps are placed on bedside tables, in niches, and on tables, near furniture. 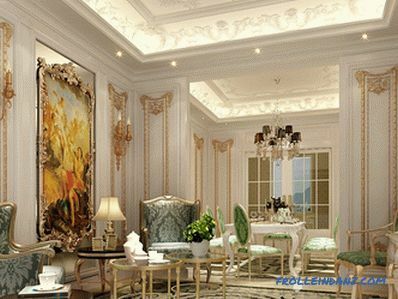 In this case, the room must hang the central chandelier: pompous and luxurious in the living room, simple and large in the kitchen and in the bedroom. Most often the lampshades have fabric upholstery, which is combined with upholstery of upholstered furniture or bedspreads. But glass, plastic, wood and crystal are allowed. The more varied the lighting devices, the more interesting and picturesque the interior looks. 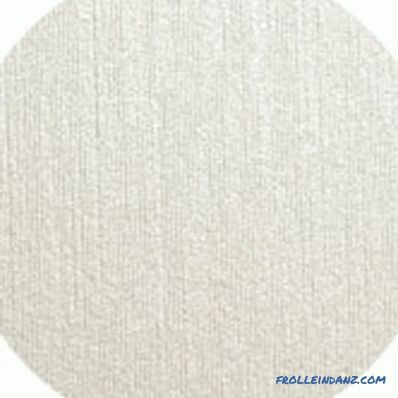 Fabrics for the interior design are selected with calm pastel coloring, monophonic or with a beautiful pattern. They should emphasize the beauty of the design, complement it. They use refractive and scattering materials: silk, velvet, satin, organza or taffeta. Fabrics choose different for upholstery, curtains and decorative pillows. 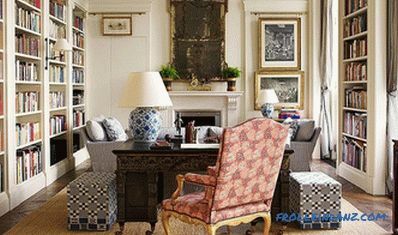 The ability to beautifully combine a large number of different textiles allocates French interiors. The main impression that should end up is a simple and at the same time luxurious interior, created with a slight negligence. The decor of the library room. A distinctive feature of the interior is a fireplace. If earlier it had a practical function - it filled the room with warmth. 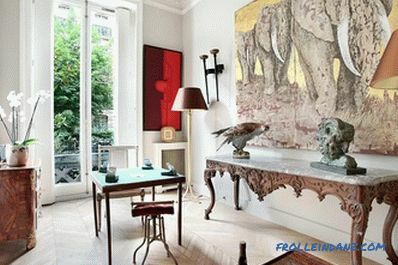 Today it is more a decorative item, creating the spirit of French luxury in a small apartment. The interior of the living room with a fireplace.